In CARE’s experience, separating families puts women and girls at risk of sexual exploitation and abuse. In the aftermath of cyclone Idai CARE is working to reunite families and provide emergency family shelters with solar lighting in bathrooms. We are also training local protection committees and establishing reporting mechanisms to minimise risks of abuse. CARE is part of the COSACA consortium of international aid organisations working in Mozambique (other members are Oxfam and Save the Children). CARE staff are currently 7 of the 10-person COSACA emergency response team on the ground, with 3 more CARE staff on standby, including a gender in emergency specialist. The team has assembled relief materials (tents, shelter kits, tarpaulins, ropes, hygiene kits, family non-food item kits) and is currently organising air cargo to move the relief materials from Chimoio to Beira. Heavy rains are expected for the rest of this week, which will exacerbate the already large-scale flooding with some areas around Pungwe, Nhamatanda and Buzi nearly entirely covered in water. The most recent estimate of population in Mozambique directly impacted by the flooding is 400,000 – that does not include people indirectly impacted and does not reflect the potential number of casualties, which remains unknown at this stage. Currently 19 evacuation/temporary accommodation centres have been set in Dondo, and 18 in Beira. Government officials are considering the possibility of setting up two large-scale emergency camps for displaced people, possibly one in Dondo and one in Beira. A transition/triage unit has been opened in Beira port, to provide immediate health assistance, and facilitate relocation of displaced people. The COSACA team is working on a response strategy (working within the broader UN humanitarian 'cluster' system which coordinates the overall response in partnership with government). The first phase (1-2 months) is likely to focus on immediate provision of shelter kits, non-food items (cooking items, blankets, etc), hygiene kits and safe water and sanitation. This is likely to be followed by continued support to transit centres (for people returning to their homes) and to any longer-term camps for displaced people, including child protection, gender-based violence prevention and protection, and water, sanitation and hygiene support. On the night of Thursday, 14 March 2019, Mozambique was hit by tropical cyclone Idai. CARE, as part of an emergency coalition group of humanitarian organisations, sent a team of experts and government officials to Beira to assess the damage on Friday right after the cyclone happened. The teams focused on search and rescue of people while assessing the initial damage and the most pressing needs. On Saturday night teams located 70 km north of Beira were involved in rescuing people from rising flood waters. The needs are massive. At least 1.5 million people in the region (Malawi, Mozambique and Zimbabwe) have been affected, with at least 400,000 in Mozambique having been directly impacted. On Monday, 18 March, an assessment team conducting a fly-over of Buzi district (an area located near Beira city) identified at least 5,000 people stranded on roof tops. The most pressing needs now are search and rescue, food, water, and shelter. The official death toll remains at 84 however the President of Mozambique believes in excess of 1000 people have died. Officials expect the numbers of affected people might grow rapidly. “Things have pretty much ground to a halt because of the power outages and the lack of water – both very critical needs for survival. The impact of these developments comes at a very dear cost to Venezuelans in terms of their general health and sanitation needs. Even more worryingly, there are reports of increased incidents of criminality to compound what was an already catastrophic humanitarian situation. Women and girls are increasingly exposed to and are vulnerable to abuse and exploitation. CARE and its partners are continuing to provide support to ensure that tackling gender-based violence, and the well-being of women and girls, are at the forefront of responding to this crisis. The food security situation continues to deteriorate due to conflict-driven displacement, low crop production, economic crisis, climatic shocks and humanitarian access challenges due to security concerns and an increasing number of checkpoints and fees demanded. 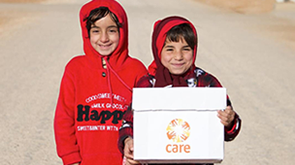 As of February 2019, CARE has reached 309,000 people, representing 4% of the 7.1 million affected people, with food, nutrition, livelihoods, health (including sexual and reproductive health), gender-based violence protection, and peacebuilding support. Recent activities include a community-based participatory planning project in Pariang county registering households under the Food for Asset Project, and training for peace committees in two counties on conflict sensitivity and management. How support from players of People’s Postcode Lottery will help CARE's work. 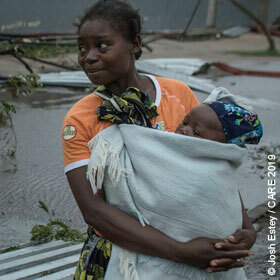 A devastating cyclone has brought death and destruction to Mozambique, Zimbabwe, and Malawi.